Tonight the Islington Assembly Hall is busy well before the opening act comes on, which proves to be a wise move as Stevie Nimmo is the support and is an artist not to be missed. His album "Sky won't fall" came out earlier this year and is a great album, so I was looking forward to hearing some of the songs played live, and I wasn't disappointed. Songs such as "Running on back to you" featured in tonight's set and sounded even better than they do on the album - I always think Blues music sounds better live. 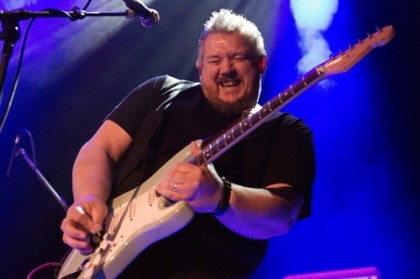 Stevie Nimmo is backed by a guitarist and bassist and puts in an excellent set before making way for the legendary Robin Trower. 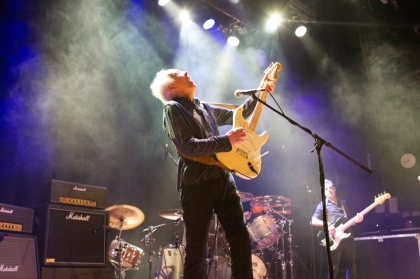 It's only a year or so since Robin Trower last played London but I'm glad he's back as he's one hell of a talented musician - a great songwriter and stuningly good guitar player. There are very few guitarists who can play long instrumental sections or solos and still keep my interest, but Robin Trower is one of those, and as you stand there listening to him play it's very easy to just slip away and lose yourself completely in the music. His guitar playing is simply fantastic, and he tends not to sing very much (despite having a good voice) so he can focus on the guitar playing, and when he plays so well you can totally understand his choice. He's backed by a drummer and a bass player who handles the vocals, and both do a great job, but as far as the audience is concerned then tonight is all about Robin Trower. Tonight was a superb night of music - Stevie Nimmo demonstrated that there are some very talented artists in the UK right now, then Robin Trower demonstrated that years of experience is hard to beat. Both acts were thoroughly enjoyable and if you get a chance to see either of them then go and see them.